My cookie I placed physically into your hand. You know it happened, we were both there, right? There was no need for a third person to be there to help us with that transfer. We didn't need to have a witness to say that I gave you the cookie, because you and I both already know it happened. The cookie is yours. I can't give you another one, because I don't have any left. I can't control what happens to it anymore, because it's now in your possession. You could eat it if you wanted to, or you could give it to a friend who could give it to someone else, potentially. So there's an example of an in-person exchange. Now, let's say I have a digital cookie. And I give that digital cookie to you. This is where the concept of bitcoin ties in. How do you know that digital cookie is entirely yours? In other words, how do you know I didn't send it to someone else? What if I made copies of it and downloaded them onto my computer? You would never know, right? Maybe I put that digital cookie on the Internet and a bunch of people downloaded it. See, this can be a bit of problem. With this type of exchange, nothing has to be traced back to a real identity. And that's the whole idea of bitcoin. Bitcoin allows people to send or receive money across the Internet, even to someone they may not know. How does bitcoin work exactly? A bitcoin address consists of 26-35 alphanumeric characters, beginning with the number 1 or 3, that represents the destination for a bitcoin payment. Addresses can be generated at no cost, by any user of bitcoin. One of the major differences between using the bitcoin currency and using regular money online is that bitcoin can be used without having to link any sort of real-world identity to it. Unless someone chooses to link their name to a bitcoin address (which they usually don't), it is hard to tell who owns the address. Bitcoin does not keep track of users; it keeps track of addresses and where the money is going. The current price of ONE bitcoin (as of December 20, 2017) is equivalent to $12,908 US. That's a lot of dollars. The price of bitcoin fluctuates constantly and is determined by open-market bidding on bitcoin exchanges, similar to the way that stock and gold prices are determined by bidding on exchanges. You're probably wondering, "Why the attraction?" right? One major factor for many investors is that bitcoin is decentralized and limited, which makes it hard for the government to trace. Also, unlike fiat money produced by central banks, there is a cap set on total bitcoins, limiting how much the currency can loss value through inflation. For people who don't trust banks, this can be a big benefit. Bitcoin users also like using bitcoin because it's fast. For example, When you transfer a check from another bank into your bank, the bank will often hold that money for several days, because it can't count on the funds are really available. Similarly, international wire transfers can take a relatively long time. Bitcoin transactions, however, are generally far faster. Transactions can be instantaneous if they are “zero-confirmation” transactions, meaning that the merchant takes on the risk of accepting a transaction that hasn’t yet been confirmed by the bitcoin blockchain. At this point, you probably have a better understanding of what a bitcoin is and how it works. It can still be confusing, though. 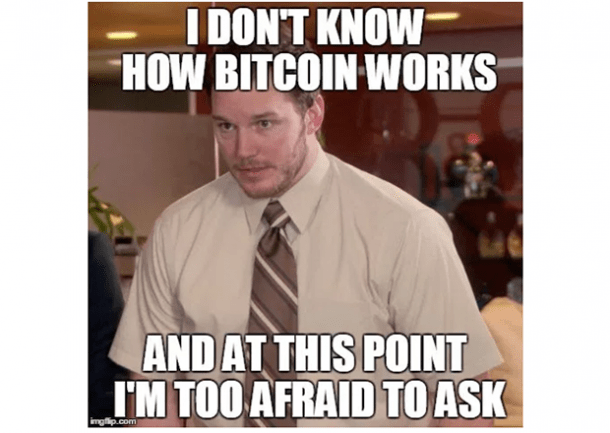 If you want to know more about bitcoin, here are 17 memes that will help you understand bitcoin and how it works. 1. In January of 2009, the very first bitcoin came to be. The first transaction took place a few days later. 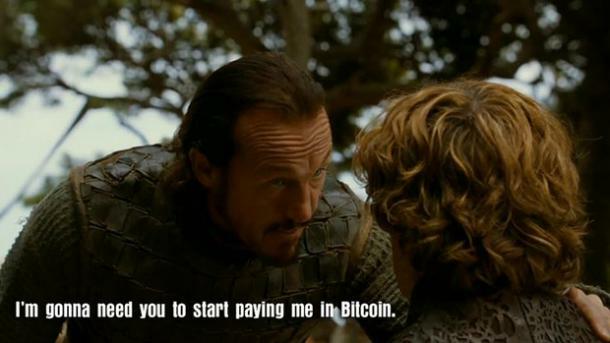 "I'm gonna need you to start paying me in Bitcoin." 2. A year later after bitcoin's release, programmer Laszlo Hanyecz paid 10,000 bitcoins for one pizza. During this time, that was only worth $25 US currency. "Her: He's probably thinking about other girls... 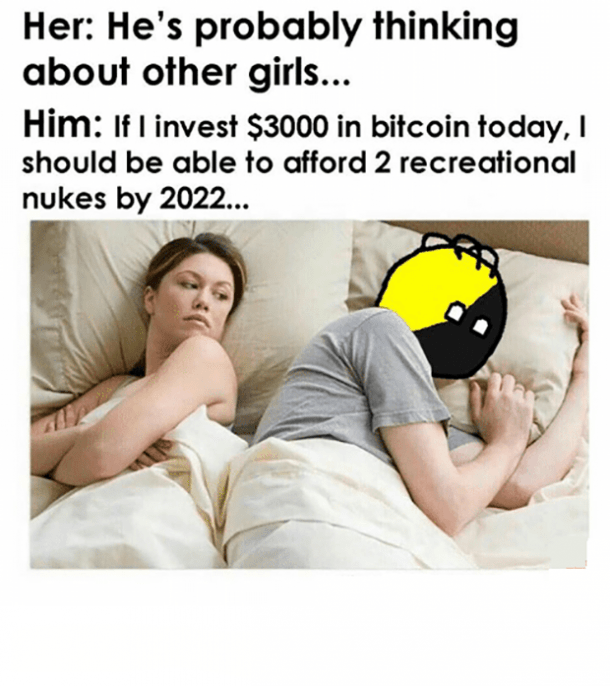 Him: If I invest $3000 in bitcoin today, I should be able to afford 2 recreational nukes by 2022." 3. In the summer of 2010, bitcoin’s value increased tenfold in just five days. 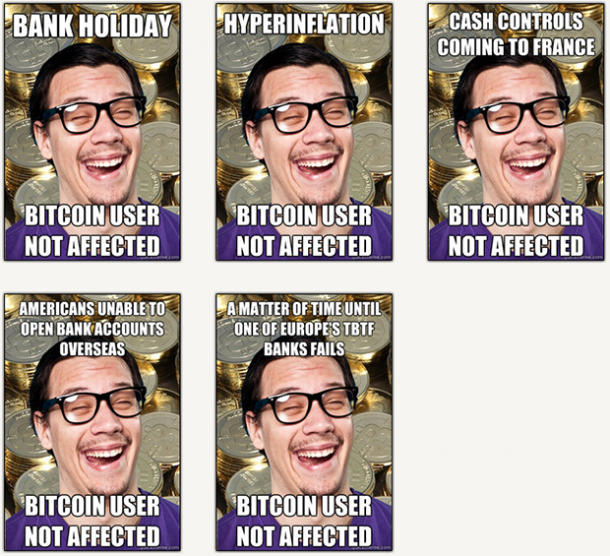 "Bank holiday, bitcoin user not affected. Hyperinflation, bitcoin user not affected. Cash controls coming to France, bitcoin user not affected. Americans unable to open bank accounts overseas, bitcoin user not affected. A matter of time until one of Europe's TBTF banks fails, bitcoin user not affected." 4. That same year in November, bitcoin’s market cap reached $1 million. 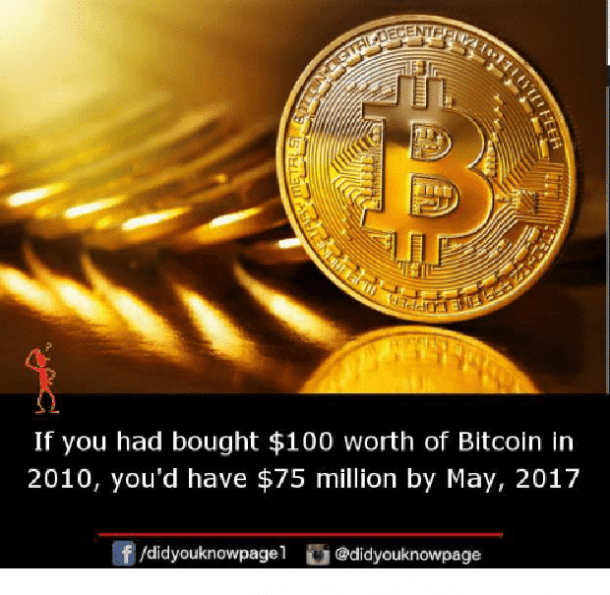 "If you had bought $100 worth of Bitcoin in 2010, you'd have $75 million by May, 2017"
5. Silk Road officially opened their business in 2011. They eventually became recognized as a bitcoin marketplace for selling illegal drugs via the dark web. "Criminals in bitcoin? 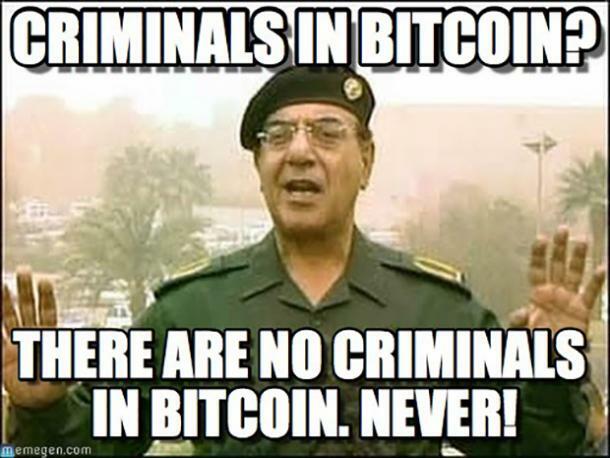 There are no criminals in bitcoin. 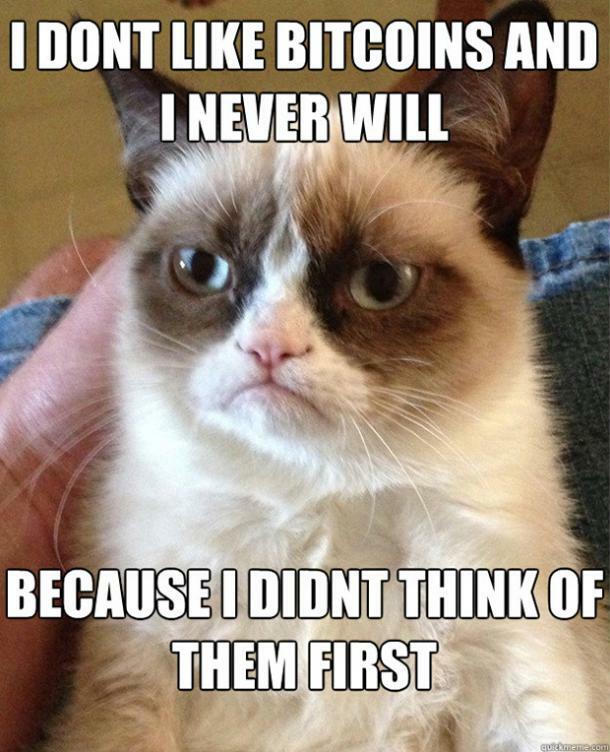 Never!" 6. Just a few months after becoming equivalent to the US dollar, bitcoin was valued at $10 in June of 2011. "Nurse: Sir you've been in a coma. It's 2025. 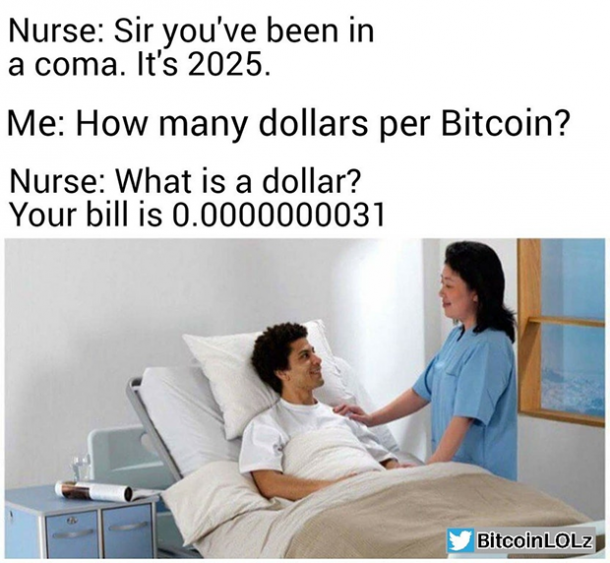 Me: How many dollars per Bitcoin? Nurse: What is a dollar? Your bill is 0.0000000031"
7. Still, the concept of bitcoin remained a mystery to several people. "I don't know how bitcoin works and at this point I'm too afraid to ask." 8. Bitcoin rose to a value above $31 per coin before plunging in the financial crash of 2011. At that point, the value dropped all the way back to single digits, and by the time the sellers were through, bitcoin was 93% off its peak. 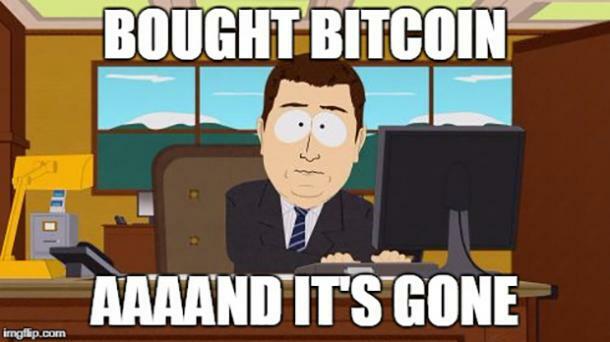 "Bought bitcoin aaaand it's gone"
9. However, bitcoin soon began to recover. "I'm not spending these until they can buy me the ENTIRE candy store!" 10. 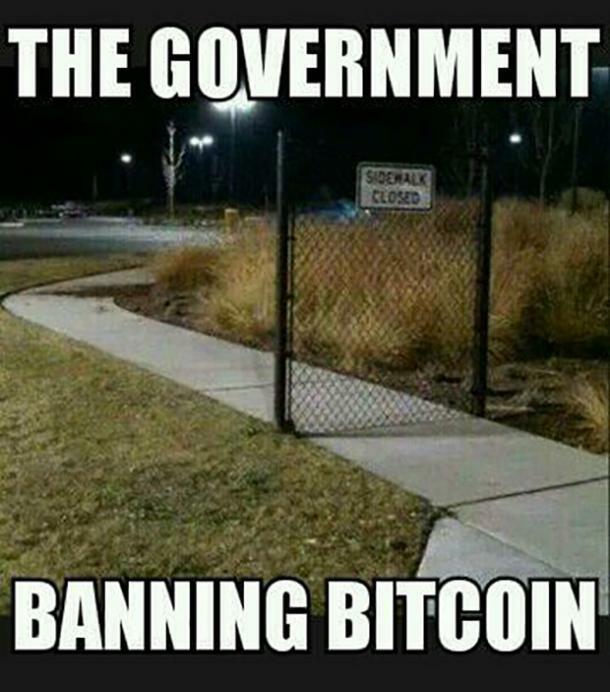 Soon people starting to request that the government ban bitcoin. But bitcoin survived, of course. 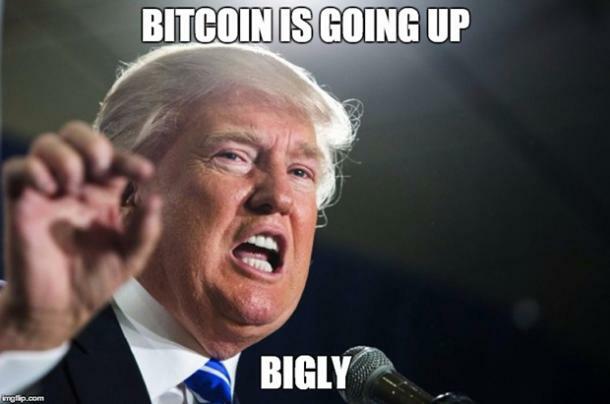 "Bitcoin is going up bigly"
12. All of a sudden, everyone and their mother wanted to invest. 13. Meanwhile, bitcoin has gained a reputation as hackers' ransom of choice. "Seems that malware encrypted our files including our bitcoin wallet"
14. Given all the craze, it’s no shock that regulators are finally stepping in. "I'm thinking of putting some money into bitcoin, do you know anything about it? Well, that would be a very risky venture. Bitcoin is quite volatile! It's a virtual currency controlled by shadowy people in an unregulated environment, without any real guarantee of return. You never know when the value will drop, or be forced down by nefarious forces, or your money stolen by unscrupulous lowlife scum! So how is that any different than the regular banking system or the stock market? When you use bitcoin, I can't charge you fees." 15. So when will the value of bitcoin peak? 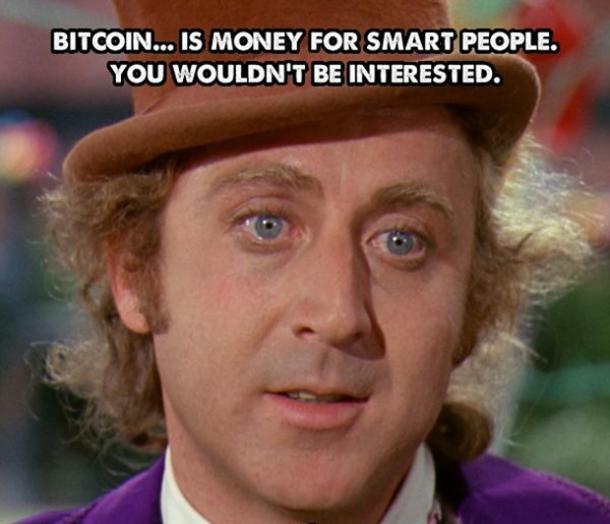 "Bitcoin...is money for smart people. You wouldn't understand." 16. 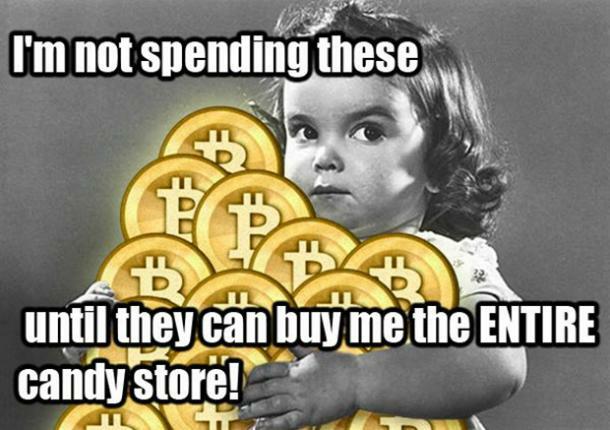 The skeptics are left wondering when the bitcoin frenzy will end. "I don't like bitcoins and I never will because I didn't think of them first." 17. Either way, it's hard to tell what bitcoin's future will look like. All we know now is that lots of people are eager to invest. 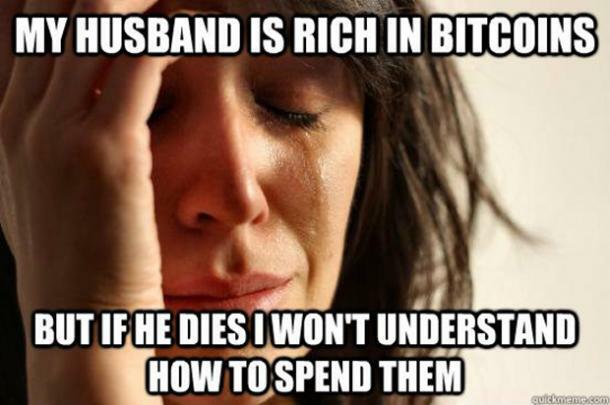 "My husband is rich in bitcoins, but if he dies then I won't understand how to spend them."